Wow, where to start? This is all very exciting, and I’m still in shock. 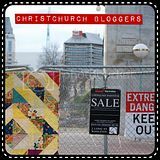 As you probably know, Christchurch is hosting the World Bookcrossing Convention in April 2009, and I’m one of the organisers. In 2008, the convention will be in London, and we’ve been trying to come up with ideas for promoting the 2009 convention there. It’s going to take a lot of promoting, because it’s a long way for people to come from Europe and North America, and while we love all our Australian bookcrossing friends, it would be nice to have a good number of guests from further afield, to make it a true world convention. Anyway, while we were thinking small scale about bookstrings and jandals, Skyring was thinking big. And talking to other bookcrossers who think equally big. And what eventuated was a plan to send an ambassador from NZ to the London convention, to be funded by donations from bookcrossers around the world. And he asked the NZBC Yahoo group to choose an ambassador. And to cut a long story (and a lot of discussion and voting) short, I was picked!!!! Otakuu was a *very* close second (there was only one vote in it), so we’re now trying to figure out ways we can get more donations in so she can come too. Going to London will be fantastic, going with a friend would be even better! And that’s not all the excitement, either. The plan is to get a Round the World ticket, so that on the way there and back I can stop off in a few other places (hopefully hosted by bookcrossers everywhere I stop, so we won’t have to find the money for accommodation and food), and promote the 2009 convention there as well. There’s a few cities in North America which are already on the “must visit” list because of the wonderful bookcrossers that live there, and I’m sure the list will grow even longer by April. It’s going to be a busy trip, but it’ll be worth it! I just can’t get over the fact that I was chosen to represent NZ bookcrossers. I feel so honoured. And so excited! I’m going to London for the bookcrossing convention!!!!!!!! So far today I’ve been using my holiday to clean. We’ve got the Bookcrossing Christmas Party here on Tuesday night, so I want everything tidy for that, plus we’re heading down south on Friday, and have a house-sitter coming to look after the cats while we’re away, and I’ve suddenly realised that means a stranger is going to be able to look through my cupboards, and see all the mess that’s normally hidden from the view of strangers. So a serious spring-clean is in order this week. I started on the study today, which was in serious need of a tidy-up after MrPloppy fixed my computer – he’d moved a lot of things to get to it, and all the cables were just plugged in any which way while he was testing that everything was working ok. So I cleared the desk, unplugged everything, and put it all back together properly, with the cables tucked away down the back of the desk the way I like it, and rearranged my bookcrossing supplies so I can find everything again. Plus I moved the computer to the other side of the desk, where it should be better ventilated, which should hopefully help with the overheating problem that probably caused it to die in the first place. Next on the list is the bedroom (eek! it seems to have turned into a dumping ground for everything we can’t find a place for recently, so that’s going to be a huge job), then the spare room (another dumping ground), then the kitchen cupboards. Oh, and sometime this week I have to finish the last of my christmas shopping. No, not *that* kind of pox! But the doctor confirmed I have definitely got chickenpox. And as I’m highly contagious I’m under orders to confine myself to the house and not go back to work until at least Monday. I expect I’ll be getting a lot of reading done over the next few days. I might even get my diary caught up – although the headache is making it a bit too painful to stare at a computer screen for very long. A couple of weeks ago, I was in Alexandra visiting my family. And my nephew had chickenpox. I’ve now got a headachey fever, and a couple of suspiciously blister-like spots. And I never had chickenpox as a child. I’ve got a doctor’s appointment this morning – I’m hoping he’ll tell me I’m just being a hypochondriac and all I’ve got is flu and a bit of acne. But somehow I suspect not.